Third lander from Hayabusa2 has less than a day to collect data before its battery runs out. The mission is now racing against time. MASCOT's battery will only last about 16 hours, says Makoto Yoshikawa, the Hayabusa2 mission manager from the Japan Aerospace Exploration Agency. "We can communicate with MASCOT for maybe ten more hours, so now is a very important time,” he says. The lander, built by the German and French space agencies, has already sent back its first image, of its descent. It has also sent some preliminary data to the Hayabusa2. The lander is scheduled to visit three sites on the 880-metre-wide asteroid, using an external swinging arm to ‘hop’ around in the asteroid’s low gravity. The first instruction to move has already been sent. MASCOT is equipped to measure the temperature on the surface and during the descent as well as the asteroid’s magnetic field. It will also study the composition of the surface. Stephan Ulamec, the MASCOT payload manager from the German Aerospace Center in Cologne, says the mission seems to have gone smoothly. “What is unexpected is that everything worked really as planned,” he says. But the team will have to wait for the data to really know how successful the mission is, says Ulamec. 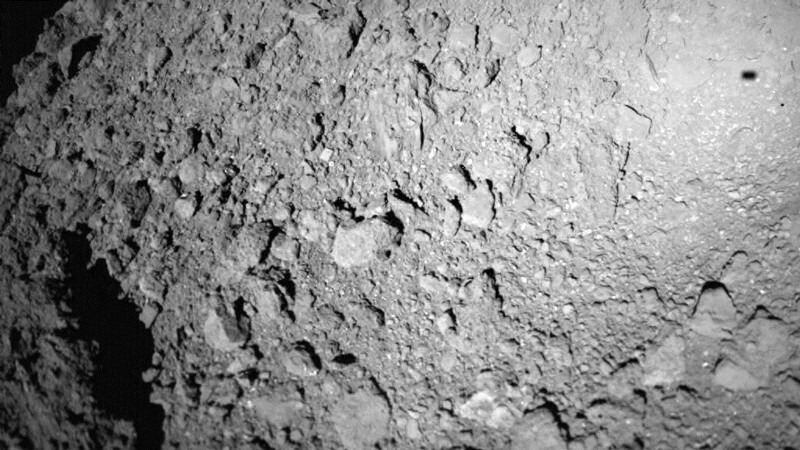 Ryugu is made up of material from the early Solar System, and scientists think that studying the asteroid will give them an insight into the evolution of Earth and other planets. Mission scientists selected the southern hemisphere as the landing site in part because it is sheltered from cosmic radiation and solar winds that might have altered the surface from its primordial state. The area also has fewer large boulders that might impede MASCOT’s progress. MASCOT was one of four landers aboard Hayabusa2. Two others, MINERVA-II 1A and 1B, landed safely on Ryugu last month. A third MINERVA-II rover is expected to land next July, and the probe itself will also touch down to collect samples, before departing for Earth at the end of 2019. Alice Gorman, a space archaeologist at Flinders University in Adelaide, Australia, says that there is a lot of interest in asteroids such as Ryugu because they contain carbon and organic molecules. “The reason why this is so fascinating is because there are big questions about the source of water on Earth, and the origin of life on Earth,” she says. At a press conference in Germany, the French and German space agencies announced they plan to partner with Japan in a 2024 mission to send a rover to the Martian moons Deimos and Phobos — where it will collect a sample before returning to Earth. Correction 03 October 2018: An earlier version of the standfirst erroneously stated that the MASCOT lander will collect samples. It will only collect data.